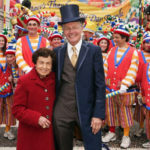 Rose Richardone, at the Macy’s Thanksgiving Day parade. Robin Hall, Senior VP of Macy’s, speaking of Rose Richardone, who retired from Macy’s on September 5th at the age of 92. Hall met Richardone when she was celebrating her 70th anniversary at the company.